This brightly-colored vegetable soup provides a lot of vitamin A, which is good for your toddler’s skin and eyes. 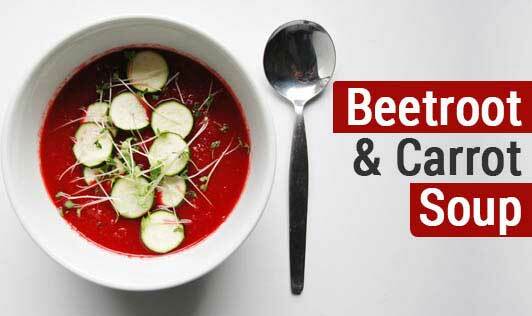 Beetroot gives the soup its natural sweetness and lovely red color. Don’t worry if your toddler makes a mess of it. The stains are totally worth all the goodness you get from the veggies. Just make sure that your kid is not allergic to any vegetable before starting. First wash the vegetables well. Add beetroot and carrot to the pressure cooker, 1 cup of water and pressure cook (approximately 2 whistles) for some time. Once cooled, blend the vegetables in a blender. Strain the soup using a strainer. Transfer the soup to a nonstick pan and bring to a boil.